The Ibanez 2018 SA560MB Electric Guitar in Aqua Blue Flat is a sophisticated model at a surprisingly affordable price. Boasting superb appointments throughout, the SA560MB can easily hold its own in the studio or out on tour, thanks to luxurious tonewoods and high-quality appointments throughout. For a no-nonsense workhorse that can do it in style, the SA560MB is perfect. 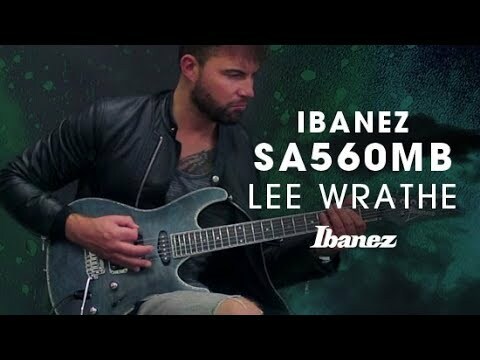 The SA560MB is shaped to Ibanez's slimline S series body profile, which is perfect for players who crave a figure-hugging feel. The subtle arched top pairs well with the elegantly executed curves and deep double cutaways that makes it a delight to perform with. Every obstacle has been removed from your path to ensure that no matter how frantic your performance may be, you can navigate the body and neck with ease. The body is built using mahogany, which lays a warm mid-range tonal foundation with plenty of punch. Paired with the body is a maple burl top, which is finished in beautiful aqua blue flat paintwork, and completed with abalone body binding. Joined to the body of the SA560MB is an exquisite maple neck, which is shaped to the slender SA profile to ensure the neck sits just right in the hand. As lean as it may be, you can rest assured that as with every Ibanez neck, this one can take all the punishment thrown at it, allowing you to play as forcefully as you wish. Married to the neck is a luxurious ebony fingerboard, which is home to 22 medium frets that are decorated with abalone dot position inlays to guide your way in style. Fingerboard binding guarantees smooth transitions between every fret to maximise speed as you fly through solos. The Ibanez SA560MB is home to a trio of DiMarzio Black Velvet pickups, with a humbucker in the bridge position and single-coils in the middle and neck positions. Whether you're seeking clean, glassy high-end clarity, galloping mid-range chug, or bouncing lower-mids with tight articulation, the pickups are voiced to deliver a diverse tonal offering. The Ibanez 2018 SA560MB Electric Guitar in Aqua Blue Flat is equipped with an Ibanez T102 tremolo bridge, which allows accurate and highly responsive vibrato control. The Graph Tech nut works in partnership with the Ibanez tuning machines to uphold tuning integrity and string tension accurately throughout the most demanding of performances. Posted on 02/06/2018 by Merlin Extremely versatile guitar, nice stratty tones and a cutting humbucker on the bridge. Very high output due to pickups. needed to turn down the volume and tone a bit to get a warm sound distorted but clean sound is excellent. A bit rubbish that it came with no owners manual or case, even a cloth one would be better than none. The neck is superb, it plays itself, very low action and limited buzzing. Also a very beautifully finished guitar and slim and comfortable.